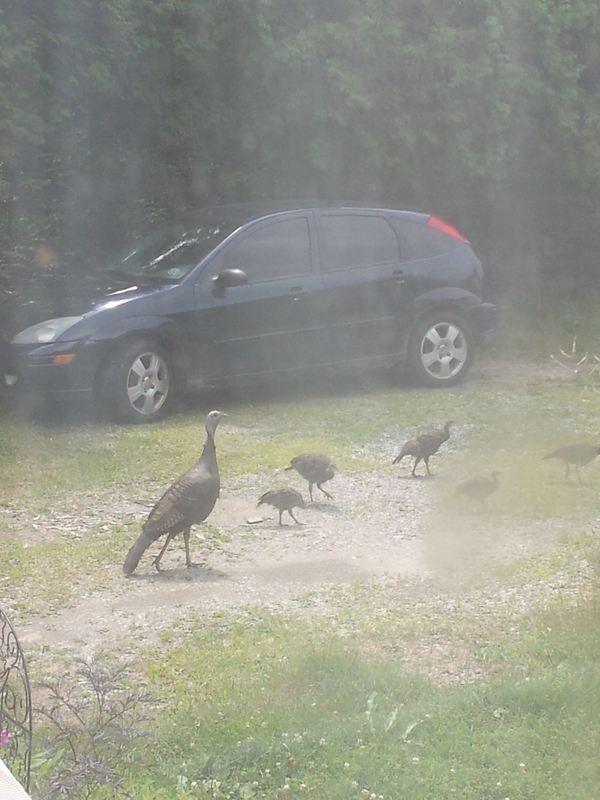 I get so excited when turkeys visit. This week 2 adults and their babies, too fast and numerous to count, have been taking a break from the woods to walk around my house and garden picking at bugs, slugs, berries and buds. The mothers are so protective: they are on constant vigilance. I have to watch very carefully because if they even see me at a window they will run. It’s very eerie that I can be standing away from a window but Mom’s eye will be on me. I’m not sure if she can see me or is just watching the window but she always seems to be looking right at me. I got a few good shots holding my phone camera against some unscreened windows, hiding to the side. That must have been one of the first new turkeys. In 1984 the Ministry of Natural Resources exchanged wild turkeys from states in the U.S. for animals we had but they had made extinct. We sent river otters to Missouri in exchange for turkeys. Canada Geese went to Iowa, Hungarian partridge went to New Jersey and Vermont, 50 moose went to Michigan. 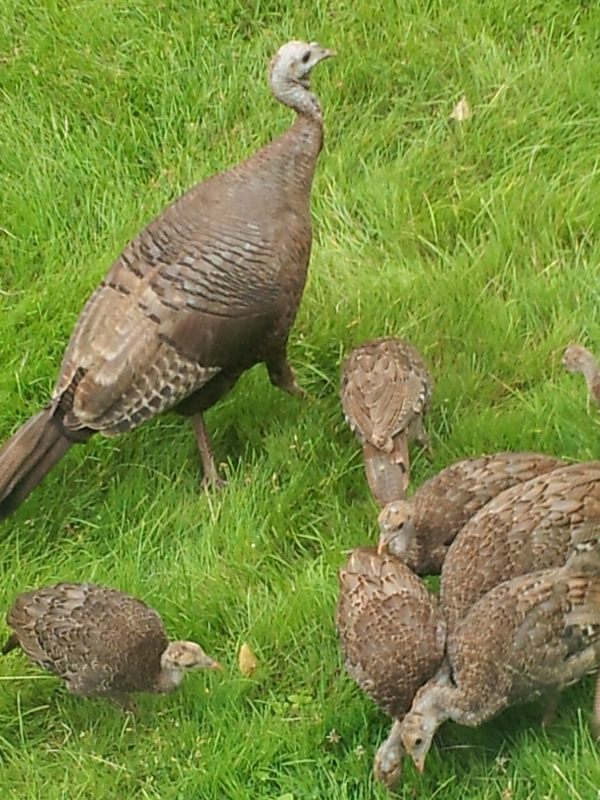 As a result, 274 wild turkeys were released throughout southern Ontario. They have proliferated, even reaching Muskoka which is north of their natural, original habitat. In fact, they came back so fast it only took 5 years before they could be hunted again. Too bad, I can’t imagine looking at a beautiful beast then blasting it with a gun, but we have to keep a balance, too, as they will eat the eggs of grouse and other ground birds. At least now there is a specific season and amount you can ‘cull’. 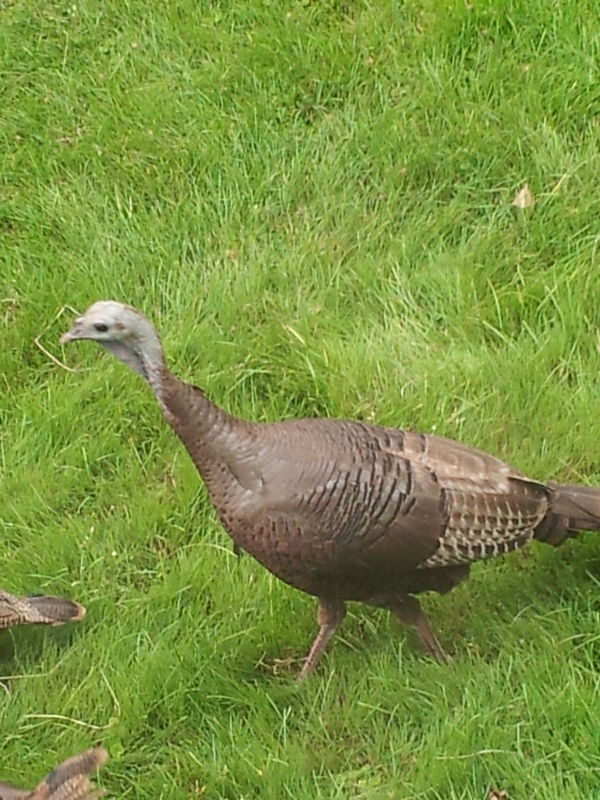 Wild turkeys aren’t such a rare sight anymore but people are always delighted to see them. We should all be happy that things CAN get better. Twenty years ago our Great Lakes were not as clean as they are now. We CAN turn things around if we really try.